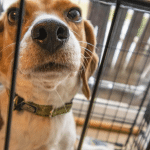 If you already have one or more dogs and are thinking about getting a rescue dog, you may worry about how the introduction process will go and how the dogs will get along together. 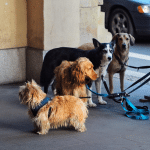 Dogs are naturally social animals and most dogs will be happy to have a canine companion, but how you facilitate the introduction and how you control the rules and conditions under which dogs live together is important to your success. In the six years that my fiance and I have had our first dog, Sofie, we have introduced her to many dogs. We continued to foster dogs while we had Sofie, and also added some permanent additions to our family. From older small dogs that didn’t always have patience for Sofie’s mischievous puppy ways to a large, nervous rottweiler who had to learn to control her weight and power around the much smaller dog, Sofie has had many housemates, and has learned to live with each of them peacefully. You can introduce a new dog to your household, even if the dog’s background is unknown and your existing dogs are less than perfectly polite. In order for the introduction to go smoothly, you should have complete control over the dogs and the circumstances. 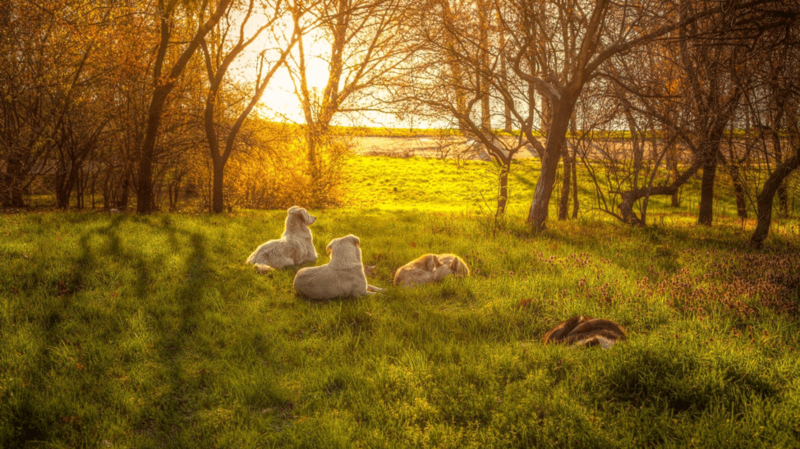 Going forward, you can keep the peace between your new dog and your old one, so that your family becomes an integrated pack that functions smoothly together. It is essential that you control first interactions calmly, showing dogs what kind of energy is appropriate. It is important to establish rules, but equally important that you not make dogs fearful or anxious. Let dogs meet outside of your house first. Choose a neutral area, and exercise both dogs separately first so that they are both in a calm, relaxed state. When you are ready to introduce the dogs, have one person walk one dog on one side of the road, and another person walks the other dog on the other. Walk separately until dogs are not reacting to each other, than gradually move close together, until the people are walking side by side with the dogs on the outside. If at any time dogs react to each other, wait until they have stopped reacting to move closer. Once dogs are calmly walking on either side of the people, side by side, one person should move forward so that they are walking ahead. The following dog can sniff the leading dog, then switch. If sniffing goes well, you can let the dogs walk side by side. Walk in this way for some time, until both dogs are calmly walking together and are no longer interested in sniffing or interacting. If dogs try to play at this point, restrict them. When dogs are calm and relaxed outside together, you can introduce them in the home. A good way to do this bring the new dog into a relatively neutral room in your house, like a bedroom or bathroom, and let the dogs get used to each other’s scent through the door. When dogs are no longer reacting, you can introduce them through a baby gate. You should not let the new dogs interact directly, but keep them separated by a baby gate, for the first couple of days, until you have a sense of how their interactions are going through the gate. Watch carefully for any signs of anxiety, protectiveness of space or people, or over excitedness. Once the dogs have been calmly interacting through the baby gate for several days, you can begin letting them have supervised interactions. It is wise to keep a leash on both dogs at first, so that you can easily grab them and separate them if there is a problem. Watch for even subtle signs of trouble, like a stiff stance or slightly raised lip. If you see any aggression, put yourself between the dogs and gently tell them “no”. Reward positive interactions between them with treats and your attention, but be very careful to never incite jealousy by giving one dog more attention or letting the dogs argue over goodies. Keep the dogs calm and keep all of their interactions under observation for the first few weeks, and make sure they don’t compete for anything, including your attention. Make sure you are getting off to a good start by reading Lay the Foundation: The First Week with Your Rescue Dog. Every household has its own way of maintaining peace between dogs. A range of different rules and lifestyles can work great, as long as there is some human control and dogs don’t compete. Here are some general rules. One of the most common causes for fights, even between long term housemates or siblings, is competition. We don’t know if dogs experience jealousy in the same way that we do, but they certainly display something that looks very much like jealousy. Dogs push each other out of the way for your affection and hoard toys, food, beds, etc. To some degree this competition is normal and unavoidable. 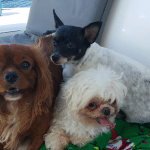 Generally, dogs work out what is most important to them of shared resources and establish a compromise, but it is important that the humans make sure that all dogs in the household are getting their share, especially if dogs are different sizes or strengths. When dogs don’t know each other well, communication may not be well established, and misunderstandings can lead to fights. Evenly matched dogs that compete without human interference are likely to eventually fight. Feeding dogs separately, as well as separating or observing them with highly valued treats or chew toys is a good way to avoid resource competition. Make sure each dog has her own bed, even if dogs want to sleep together much of the time. Share your attention equally between dogs, and never reward a dog for shoving another dog out of the way. 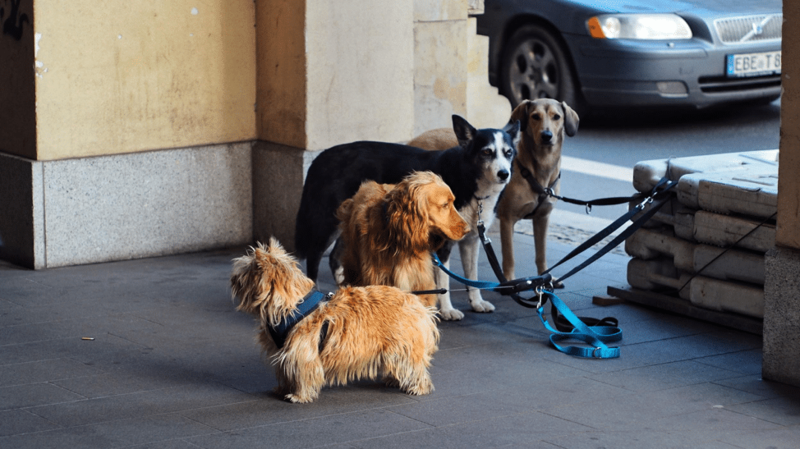 Group training sessions in which each dog waits their turn for training are a good way to establish positive social relationships and respect. Dogs will learn self control and get out of the habit of shoving other dogs out of the way when they want something. Dogs trained in this way can also learn by observing other dogs, which speeds training and helps develop bonds. Group walks and field trips can also help to solidify the pack bond. Taking relationships out of the home allows for a new perspective, and also encourages dogs to rely on each other for confidence and cues in new environments. Playing together is another great way to encourage dogs to bond. Play tug of war with a long tug toy and encourage all of your dogs to play with you. When dogs play tug by themselves without arguments you will know you have made strides in improving their bond. Some competition in play, like allowing dogs to race to be the first to catch a ball, can be a healthy outlet and source of fun, but watch carefully to make sure dogs aren’t showing aggression over the toy. Don’t allow play competition until dogs are already getting along well. Cuddling together is another important social building activity. Make sure that all dogs are comfortable and content, and that they are all getting equal attention from you. 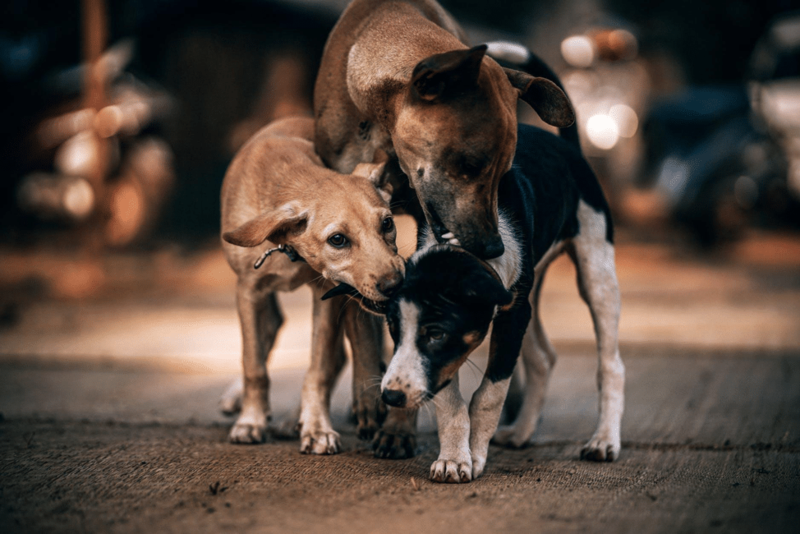 The dogs will learn to associate the warm, safe feeling of being loved by you with each other as well as they are pet and cuddled by you while touching one another. Every household has different rules for their dogs, and many situations can work well, as long as rules are fair and consistent. In our household, noisy communication is not allowed. 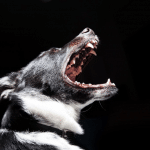 Many dogs communicate with lots of growls and vocalizations without intending anything negative, but when we have fosters coming in and out of the house, combined with nervous dogs, it is essential to maintain a calm state, even during play. Some little growlies are allowed, but we redirect with a toy whenever communication is too frenzied or excited between playing dogs. Our dogs are fed separately and we watch them to make sure they don’t steal each other’s treats or chews. There are always at least three beds down, at least one for each of them, and another larger bed for sharing as well. We don’t let our dogs shove each other going in and out of doorways, and stealing toys or beds isn’t allowed. A raised lip or stiff posture to show that something isn’t appreciated is tolerated, but no growling or snapping is allowed. We surely don’t catch every infraction, but a standard is set in the household that dogs understand and mostly abide by. As a result, our dogs get along well and each of them feels safe and secure in our home. Our dogs view each other as companions, playmates, and cuddle buddies, not as competition for our love and affection or resources.